The Chapel Hill Garden Club members contribute their time and gardening talent to beautify the community and spread the love of gardening. Our current projects are the care of a downtown planter on Columbia near Franklin Street, the upkeep and care of the entrances to Freedom House, a recovery center, and The Stratford, an assisted living facility. The club maintains annual and perennial areas, raised beds, and pots for the enjoyment of residents. In addition, the club supplies kits containing gardening tools and helpful information to new Habitat for Humanity homeowners in Orange County and Chatham County. 2000s: Made significant contributions to the NC Botanical Garden’s building fund drive and to the Healing Garden at the Ronald McDonald House. Created a “Helping Hands” committee to assist beautification programs and introduced a plant/seed exchange at every General Meetings. Tour proceeds helped build the Reeves Auditorium at the North Carolina Botanical Garden. 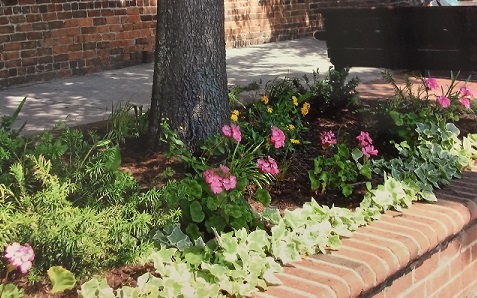 1990s: Landscaped gardens at the Horace Williams House; provided plants and gardening tools for Habitat for Humanity; donated funds for the Alice Ingram Park at Franklin and Elliott Streets. Presented the first biennial Chapel Hill Spring Garden Tour in 1996. 1980s: Adopted Jones Park, in which members cleared land for nature trails, identified and marked native flora, rescued plants, and landscaped the entrance. 1970s: Maintained strong ties with the North Carolina Botanical Garden through volunteer hours in the garden and fundraising for the Totten Education Center. 1960s: Advocated conservation of open spaces, roadside cleanup and beautification, and landscaping of new schools and the public library. 1950s: Published a plant selection guide for newcomers to Chapel Hill to utilize in landscaping their new homes. 1940s: Heeded the nation’s call for Victory Gardens and established a community-wide canning project. 1930s: Developed community demonstration garden; established bird refuges; placed flowers in the University Infirmary; beautified the community in difficult economic times.